Crew: 1 Gunner per cannon? The Firespray-class Patrol and Attack Ship was originally designed for planetary law enforcement and interdiction duty. Currently, in the more remote areas of the Galaxy this older model of patrol craft can be found, serving mostly in territorial patrol forces and navies. Over ten years before the outbreak of the Clone Wars, the only prototypes of these craft were sent to the prison on the planet of Oovo IV. During Jango Fett's quest to hunt down Komari Vosa, he infiltrated the prison planet. During his escape, he stole one of the Firesprays and destroyed the rest. 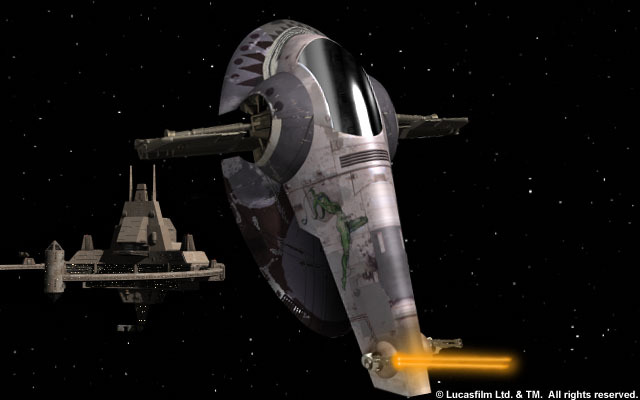 For nearly 20 years, the Firespray, Slave I was the only remaining example in the entire Galaxy. Sometime around the Battle of Yavin, KSE resuscitated the Firespray line, albeit it saw only limited production. Featuring firepower too great for civilian use, yet not enough for Kuat's home defence standards, and its non-profitable design ensured production of Firesprays would be circumscribed. These non-profitable features were the design's incredible robustness, modularity, and user-serviceability; effectively ensuring that post-sale maintenance business of these ships would not be profitable. While this is poor for the manufacturer, these characteristics are excellent for an independent bounty hunter. Firesprays remained an uncommon and exotic ship. This design could survive a tremendous beating, and featured an expansion grid allowing the addition of future hardware. Modifications for special purposes are easily had. The cockpit console rotated to allow internal maintenance and observation of the prisoner hold. Below the cockpit deck was the guard deck, holding the guard console and seating. The unique aspect of this craft is that it lands with the engines down, and in flight it is upright. As this craft comes to land, the cockpit capsule rotates to keep the crew and any passengers upright. For maximum pilot visibility and most effective weapons use, this craft flies in the vertical position. It is known that bounty hunters other than the famed Boba Fett operate this craft. The Target Acquired owned by Dej Vennor is one such example. Interestingly, it is known that just before the Battle of Hoth, civilians such as the now wanted Emon Azzameen legally owned a Firespray called the Andrasta.